The rise of China and India has been widely debated for many years now. However, even though they have long established themselves as important actors of international politics, the Russian political culture remains Western-centric. According to Fyodor Lukyanov, the Valdai Club Research Director, we have a problem comprehending different optics, although Russia is actively pursuing its Asian policy. The Valdai Club report is an attempt to look at the world processes from the perspective of Asia’s rising powers. Modern international relations have entered a period of global change unprecedented in the postwar history. The processes unleashed by the changed role of China and India are making an important contribution to the burgeoning “Eurasian phenomenon,” or the surge in international trade and expectations for the traditionally peripheral landlocked regions of Central Eurasia. This has a special importance today. According to Timofei Bordachev, a programme director at the Valdai Club, until recently the world politics has been only marginally interested in the Asian countries’ interests and values. However, these countries have ceased to be mere recipients of ideas and technologies and are actively promoting their own agenda on the international arena. Meanwhile, the eastern direction is becoming a priority for Russia in the context of its complicated relations with the West. When it comes to Asian political values and strategic culture, they are based on creative non-conflict interaction accepting different paradigms, not on unification of pseudo-tolerance, Russian Deputy Foreign Minister Igor Morgulov said. The Asian model is being implemented while the space for constructive dialogue is being contracted, he added. According to Morgulov, development of this region requires all-inclusive strategies. At the same time, western proposals for the region are focused on particular spheres, like trade or maritime cooperation. As for the United States’ initiatives, like the TPP or the Indo-Pacific strategy, their goal is evident: to drive a wedge between China as the single most important power in the region and the rest and to build policies vis-à-vis Asian states on a bilateral basis. All of that is rather logical. For the United States, China is not only a rival in the struggle for economic, political, and military influence, but also a nation with an alternative global technological platform. According to Andrei Bezrukov, Associate Professor at the Moscow State Institute of International Relations of the MFA of Russia (MGIMO), this platform has three main features: a sufficient set of key technologies, a market where this platform can be translated into economic clout, and an emission center capable of financing the next economic cycle. In the digital era, it is a key mission of governments to protect national critical infrastructures, eliminating foreign technological solutions from their markets, Bezrukov said. That explains the recent moves of the US authorities to hamper the activities of Chinese tech companies in the United States. What can Russia do in this situation? Paradoxically, it can make use of its still peripheral position in Asia. Russia can be a arbiter, because it is in a position to talk to all actors, regardless of their relations amongst one another. According to Bezrukov, this is how Russia is seen in the ASEAN countries like Indonesia, Vietnam, or Thailand. These counties are known to fear China’s ascent. This is quite expectable, for a large powerful country, no matter how discreetly it behaves, raises concerns among its neighbours who “look at the potential, not the intentions,” as Bezrukov put it. 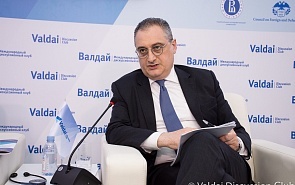 According to Igor Morgulov, Russia realizes the difficulties related to this, but its approach to regional issues is based on the principle of indivisible security. This principle makes the problem of choice of strategic partners in Asia irrelevant, while America’s containment strategy leads to nowhere. The world is entering a new economic cycle, Andrei Bezrukov stressed. For countries like China and India, whose populations have got used to permanent improvement of live standards over the past forty years, this will pose new challenges. The numerous emergent middle classes have new demands, which cannot always be satisfied, and this will entail growth in social instability. In a situation like this, creating an all-encompassing Eurasian security system is becoming an increasingly important issue. According to Bezrukov, the Eurasian states face two options. Either India, China, Russia and other countries find a way to “cement” security on the vast space from Turkey and Iran to Indonesia and from Russia’s North to the ASEAN states and build the largest market in the world with annual growth rate at 5-6%, or the United States will drive a wedge between key partners and growth rate will not exceed 1%. And which way will be chosen will depend on whether the states of Greater Eurasia understand strategic goals and interests of one another.